Ravinder was once part of a larger land mass that lies far to the northwest or west. It is not clear exactly where, or how this land mass made its way through the Ocean of Storms. For much of known history, Ravinder has been a desolate waste land – the north stuck in an everlasting cold and the south baking under a never-setting sun. 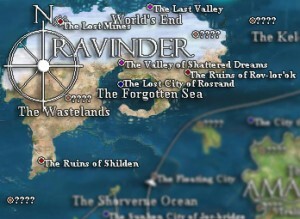 Long ago Ravinder was a rich and vibrant land capable of supporting a vast civilization of Dwarves. It had numerous mountains, rock formations, steppes, canyons, and badlands. These initial formations formed the foundation of Dwarve culture – a love of stone, earth, minerals and precious gems. Eventually in the 4th Age, civil war between the Dwarves erupted. The Dwarves pillaged the land and strip-mined its resources to fuel their war machines. Nature, in response to this exploitation, unleashed a massive horde of demons from deep within the earth. These demons rampaged through the lands destroying Dwarven civilization. A massive chain reaction occurred from this sudden release and wide spread destruction causing the northern and southern parts to be forever afflicted with a blight: the north was blanketed in a never ending winter and the south became exposed to a sun that never sets. Now, much of the surface is either a frozen tundra or barren rocks covered in ice, or a burnt desert. Ruins are scattered all over – remnants of cities and war machines dot the landscape. In some locations there are Dwarven mining pits that supposedly are so deep they go to the center of the earth. Currently, the climate is based on north or south, and they are polar opposites. The north is stuck in a never ending winter: blizzards constantly rage covering the surface with thick blankets of snow. Other areas are frozen with many layers of thick ice. Chilling winds continually blow across the landscapes which can quickly cause frostbite. The southern lands are a burnt and barren landscape: there is little living vegetation due to extreme heat and eternal droughts. Rocks, cliffs and desolate plains make up most of southern Ravinder. There are several ruined cities which are all that remain from the once great Dwarven civilization. It is unclear what natural resources Ravinder currently has. Due to the massive strip mines and uncontrolled harvesting of resources it is not unreasonable to think it contains nothing of value. It is impossible to tell due to the ‘natural’ wildlife currently presence on the continent. The wildlife of Ravinder is unnatural. It is infested with undead, mostly fallen Dwarves, and demons unleashed from the original cataclysmic event many Ages ago. It is unclear how many of these dangerous creatures are present on the continent. The only known source are records from the Arcane Order(the majority from Arch Mage Erius Riesuts travels there) and they contain no concrete numbers. Rather, the continent has been cited as incredibility dangerous and access is restricted. It is common knowledge that Ravinder is a dangerous place with terrible creatures – undead, demon, and others. Due to this, expeditions rarely occur to this continent.